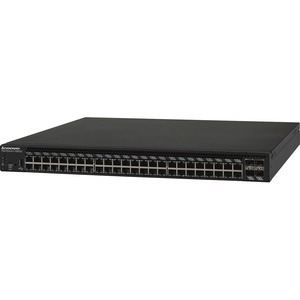 The Lenovo RackSwitch G8052 features 48 x RJ-45 1 Gigabit Ethernet (GbE) ports plus 4 x SFP+ 10 GbE ports in a flexible 1U switch. All ports come standard, and the SFP+ ports can also support SFP 1 GbE if needed, Designed with top performance in mind, the G8052 provides line-rate, high- bandwidth switching, filtering, and traffic queuing without delaying data, and large data center-grade buffers to keep traffic moving. Redundant hot-swap power and fans, along with numerous high-availability features, mean that the G8052 is always available for business-sensitive traffic. The RackSwitch G8052 is virtualized-supporting VMready technology, an innova-tive, standards-based solution to manage virtual machines (VMs) in small to large-scale data center and cloud environ-ments. VMready works with all leading VM providers. The G8052 also features OpenFlow support to help easily create software defined virtual networks (SDN) and enables a remote controller to modify the behavior of network devices through a well-defined "forwarding instruction set." The RackSwitch G8052 is cool-implementing a choice of direc-tional cooling to maximize data center layout and provisioning. Its superior airflow design complements the hot-aisle and cold-aisle data center cooling model.The RackSwitch G8052 is easy-with server-oriented provisioning via point-and-click management interfaces, along with the optional Switch Center software package for updating large groups of switches. And, the G8052 supports stacking for up to eight switches for simpli-fied switch management using a single IP management address.